Note : Please be seated 15 minutes before the commencement of the program. Refreshments will be served after the screening. ‘Santhal Family to Mill Re-Call’ is a film based on the process, performance and exhibition of ‘409 Ramkinkars’. Film Duration : 1 hour 53 mins. Synopsis: In collaboration with theatre practitioners, writers and artists, Vivan Sundaram conceives this project ‘409 Ramkinkars’, a re-take on the life and works of Ramkinkar Baij. Many of the sculptures and paintings made by Ramkinkar Baij are re-created in diverse materials by Vivan Sundaram with a team of artists and students. 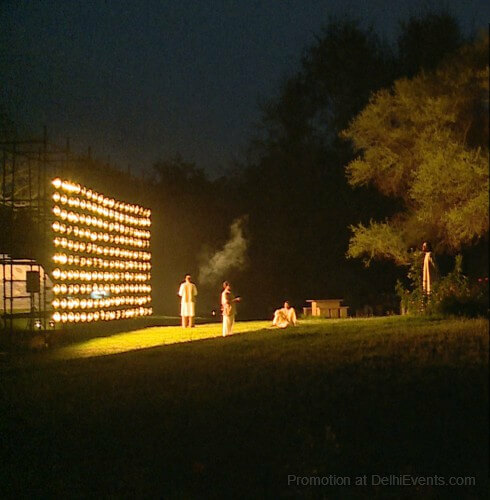 Theatre directors Anuradha Kapur, Santanu Bose, Aditee Biswas and Deepan Sivaraman, with 30 professional actors, associates and technicians, conceptualize a promenade theatre. The script is by Belinder Dhanoa. R.V.Ramani, born in Mumbai, 1957, is one of the leading documentary filmmakers in India, who has established a unique style of his own, making independent impressionistic documentaries. His films and retrospectives have been presented in many platforms. The filmmaker will be present for a conversation after the film.